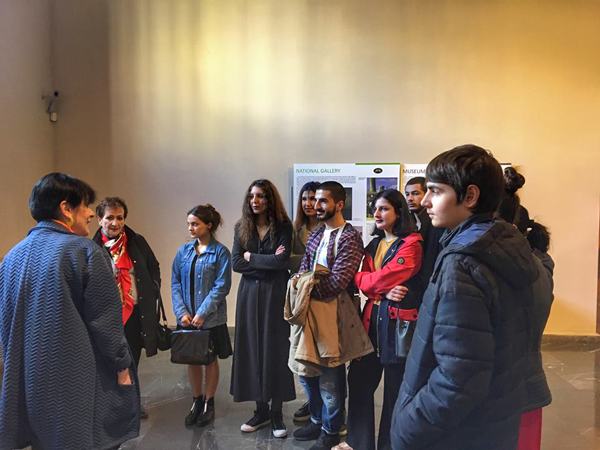 On March 22, 2019, Guram Tavartkiladze Tbilisi Teaching University, Psychology Specialty, first year students of Business and Social Sciences Faculty and Professor Tamar Pantsulaia, within the frame work of the field lecture visited the National Museum of Georgia - one of the largest scientific, educational and cultural centers of the country. The students listened to the lectures on Georgian national treasures in the collections of Simon Janashia State Museum - the richest archaeological (including "Golden kolkheti") or ethnographic material on the remains of hominids found in Dmanisi and other interesting museum exhibits. In addition, the students were introduced to Leonardo Da Vinci's paintings digital reproduction. Questions were asked, there was discussion, which further revealed the importance of culture as a general phenomenon, role and importance.